Poll Week 2: Do you like the uniforms? Poll Week 3: How well does the location fit Sushiria? Poll Week 4: How do you like the new clothing update? Poll Week 5: Opinion on Vincent? Poll Week 6: Do you think the Cook Station sounds easy? Poll Week 7: Bubble Tea, Opinion? Poll Week 8: The games out! Poll Week 9: So far, are you enjoying the game? Poll Week 10: Do you like the New Holidays? 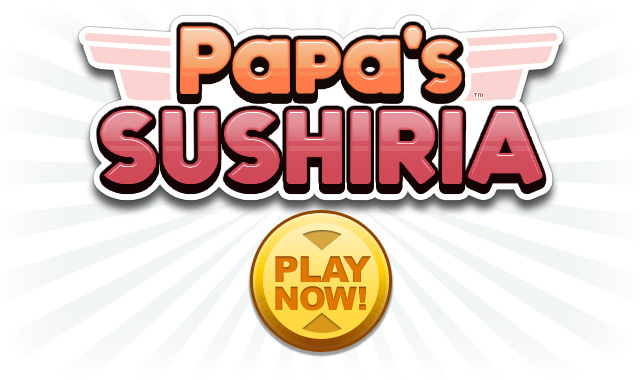 The long wait is finally over… you can now play Papa’s Sushiria!!! Your day takes a turn for the worse when you break Papa Louie’s lucky cat statue. Is this to blame for the restaurant’s underwhelming opening day? All we know is that Papa Louie left on a wild-eyed mission and you’re now stuck running the restaurant. Can you turn your luck around and master the fine art of sushi making? Perfectly cook, season, and spread the rice with the all-in-one “Sushi Square”. Then fill, roll, and top the sushi with a huge assortment of brand-new ingredients. Finish it off by cutting the sushi into bite-size morsels for your hungry customers. Bring in the bubbles! Papa’s Sushiria also has Bubble Tea to serve alongside the sushi. Mix the flavored teas with milk then add tapioca pearls or one of the many other deliciously flavored bubbles. I dunno, how would it work.? You don't even cook Sushi. Maybe, but I don't think Sushi would work and Matt and Clover don't suit Sushi. Tohru and Austin should be for Sushi. Fisheria maybe? But what dishes we can cook except sushi? Hmm... Maybe the next chefs could work on... Fisheria? Where the chefs cook fish sandwhiches topped with various ingredients? Beef, Chicken, Pork, or Steak. Waffle Fries with no toppings sadly. -My Burgeria Order is similar to James', but I order Well Done Patties while James orders Regular Patties. -I change my meat in Taco Mia, just almost like Jojo, but my toppings remain the same. -I am the only customer in Cheeseria who does not order fry toppings.